(Nanowerk News) Scientists in California are reporting development of a new generation of the microcapsules used in carbon-free copy paper, in which capsules burst and release ink with pressure from a pen. The new microcapsules burst when exposed to light, releasing their contents in ways that could have wide-ranging commercial uses from home and personal care to medicine. Their study appears in the Journal of the American Chemical Society, a weekly publication ("Chemicals On Demand with Phototriggerable Microcapsules"). A new generation of microcapsules, shown above, promise to deliver "chemicals on demand" for a wide range of uses, including medicine and personal care. Jean Fréchet, Alex Zettl and colleagues note that liquid-filled microcapsules have many other uses, including self-healing plastics. Those plastics contain one group of microscapsules filled with monomer and another with a catalyst. When scratches rip open the capsules, the contents flow, mix, and form a seal. Microcapsules that burst open when exposed to light would have great advantages, the scientists say. Light could be focused to a pinpoint to kill cancer cells, for instance, or shined over an large area to print a pattern. 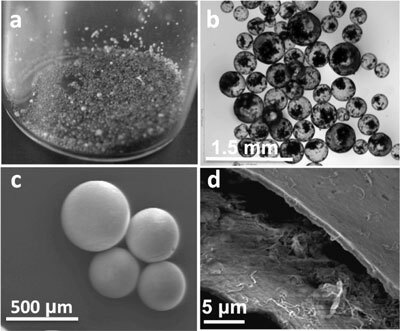 The new microcapsules consist of nylon spheres about the size of a grain of sand. They enclose a liquid chemical sprinkled with carbon nanotubes. The nanotubes convert laser light to heat that bursts the nylon capsule, releasing the chemical. Using such a system, doctors, for example, might inject microcapsules containing anti-cancer drugs to specific cells and make the capsules burst upon exposure to laser light, delivering their contents precisely where and when they are needed in the body.